The Estes Crew had a great final week of work. Monday to Wednesday we worked on a very challenging project on the Wild Basin Trail just before Calypso Cascades. For this project we were replacing an old turnpike in a very muddy area. This week was by far the dirtiest we ever were this season. Everyone was covered in mud, but Emily out did us all by getting to the point that she was almost unrecognizable from being so muddy. The project required a lot of rock work. We hauled, chiseled, and crushed rocks almost constantly. In the end the trail was much easier to hike and much less muddy even though we were not able to completely finish the project. For our final work day on Thursday we hiked up to Bluebird Lake clearing trail the whole way. We were able to take several downed trees off the trail on this thirteen mile hike. Everyone on the crew is looking forward to our final education week. We had a great season of work and accomplished a lot. 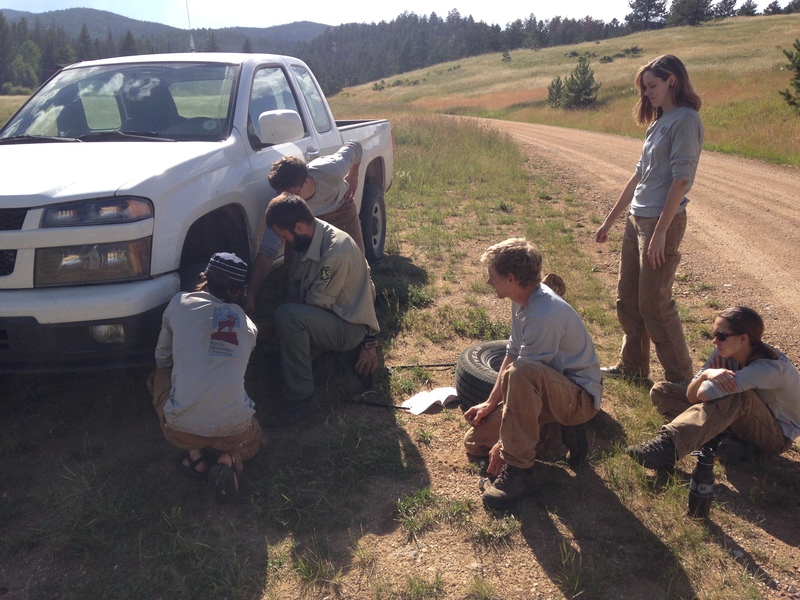 For last week in the field, the Red Feather Crew returned to the Comanche Wilderness area and spent the week working on the Zimmerman Trail. Although we had been given a list of several possible trails to cover, we found that the Zimmerman Trail was so beset with fallen trees, that there was no shortage of work to be done. In all, we bucked out about 75 trees, ranging from 4 inches to approximately a yard in diameter; needless to say, it was A LOT of sawing. Otherwise, we had a good last week together, (and were particularly grateful for the lack of hailstorms and other fluke weather occurrences.) It’s been a great season overall, and we are thankful to have been able to spend time exploring the many different areas of the Canyon Lakes Ranger District on such a variety of trails. The got a hefty amount of hazard tree felling in during their last week in the field. Tuesday through Friday, we drove out to the Fraser Experimental Forest to work on the Creekside and Flume trails, felling hazard trees within twenty yards of the trail. 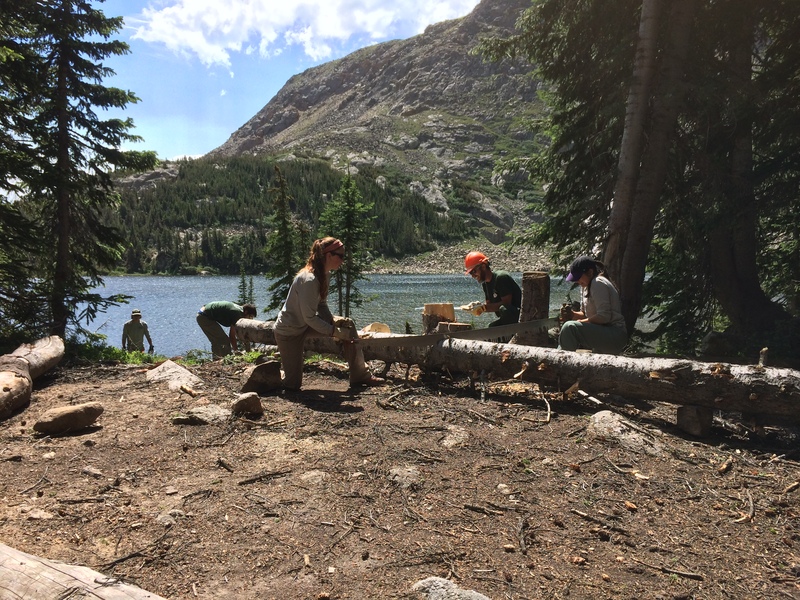 Day after day, each of us worked with Forest Service sawyers to knock out the dangerous sections of dead Lodgepole Pines along the trails, creating a safer path for the public and preventing trees from falling on the trail in the future. In order to keep up with our experienced supervisors with the Forest Service, we learned new cutting techniques for tough-to-fell trees, preparing us to advance our abilities after our RMCCC chapter has ended. Throughout the four days of cutting, we felled upwards of 250 trees between the six of us. Take that, trees! Henry) for a total of 11 miles round trip to help carry out heavy abandoned gear from the campsite. Stubborn though the llamas are, we had a blast laughing at their silly llama-isms and dragging them through thickets and streams. With heavy hearts, we packed up our belongings from the Shadow Mountain Village this Sunday and headed back to Estes for Final Week. It’s been a heck of a time working with these 5 strangers for the summer, and I can’t imagine spending this summer any other way. 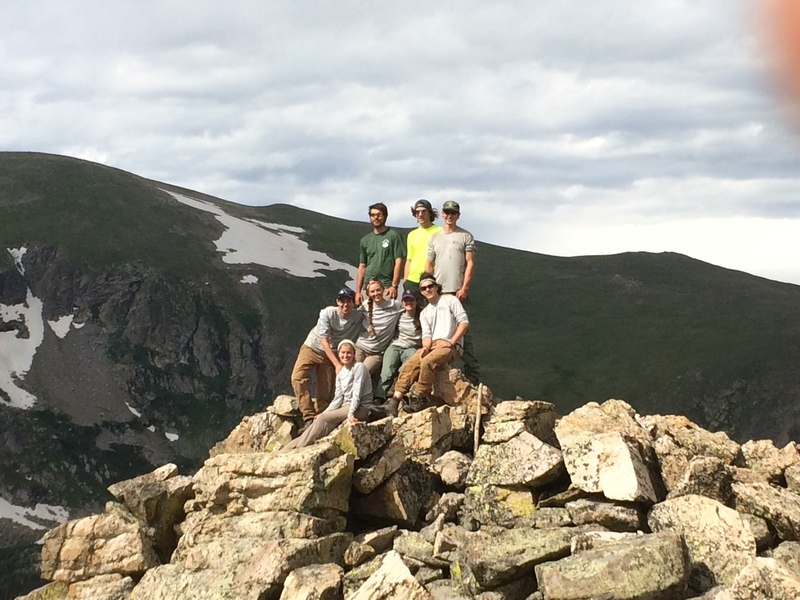 The Rawah Crew maintained 14 miles of the Camp Lake Loop in the Rawah Wilderness Area. In that 14 miles we had light work of 30 trees (most palm to fingertips wide). While up there we also enjoy the sights of Twin Crater Lake, possibly one of the most beautiful locations in Colorado. To finish up the week we cleaned all the tools, organized the shop, watched the gov’t vehicle, cleaned our bunk and had a friendly potluck with the hosts. All in all a good final week. 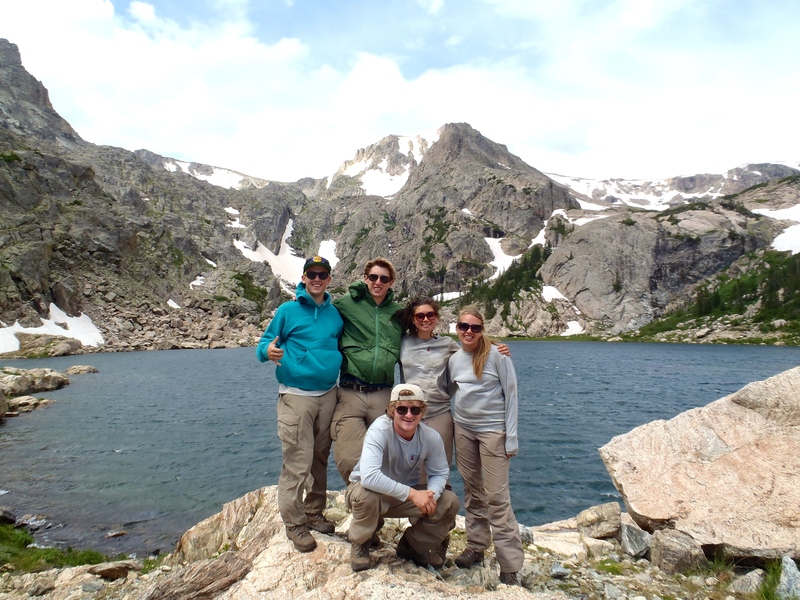 This week the Boulder Crew closed out a fantastic season with a bomber three-day backpacking trip to Diamond Lake. We performed routine maintenance on the ten campsites that surround the lake, digging drains and clearing hazard trees. Additionally, we each had an opportunity to practice bucking trees with a crosscut. Courtney, working on her crosscut certification, taught the crew proper technique and form. 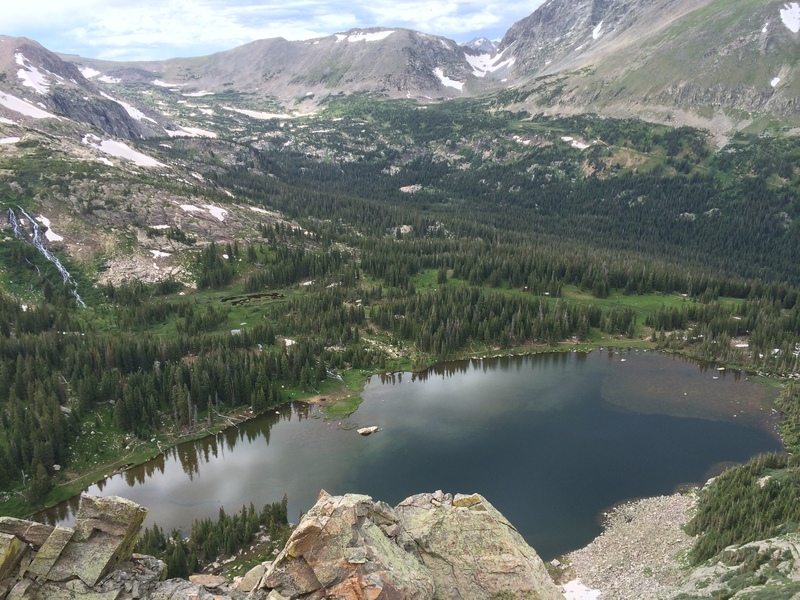 Since these designated campsites are in the Indian Peaks Wilderness, campfires are prohibited; let’s just say no campfire rings stood a chance with us coming for them! After finishing work for the day, we went fishing and swimming in the lake, cooked delicious dinners, played cribbage, and refined our rap and beat-box skills. Being detached from society and normal day-to-day amenities helped us to connect more with the nature surrounding us, and the projects we were completing. We watched sunsets and sunrises, climbed the rocks, and read mountain quotes for inspiration. On Friday, we returned a little early to clean the Nederland Work Center for the last time of our season and go over evaluations with our Forest Service supervisor Michael. On our final day we were able to work alongside 32 other volunteers from Teens Inc., and the Nederland Area Trails Association on the “Bus & Shack” Trail in the West Magnolia recreation area. 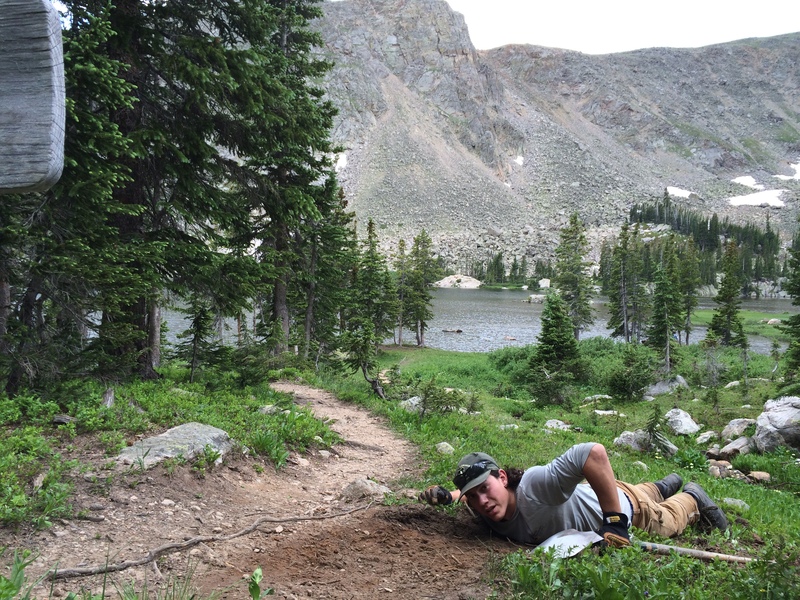 We all put our trail knowledge to good use and worked directly with the volunteers to teach them the art of trail drainage! It felt awesome to be on the other side, teaching others how to do the work we had been completing all summer. It felt appropriate for our last day. We returned home for a farewell pizza dinner provided by our wonderful boss Michael, and began packing for our final week in Estes Park. 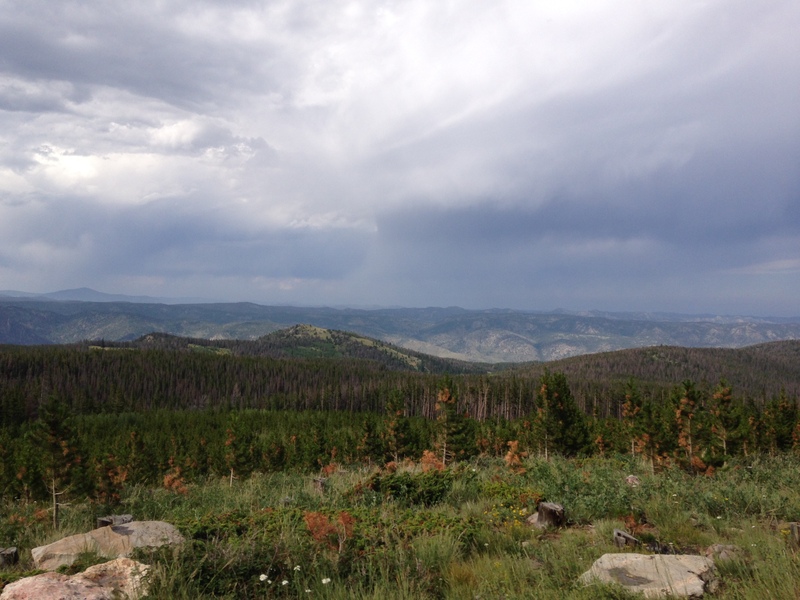 It was a great summer in Nederland Colorado, and we will miss all of our new Forest Service friends! 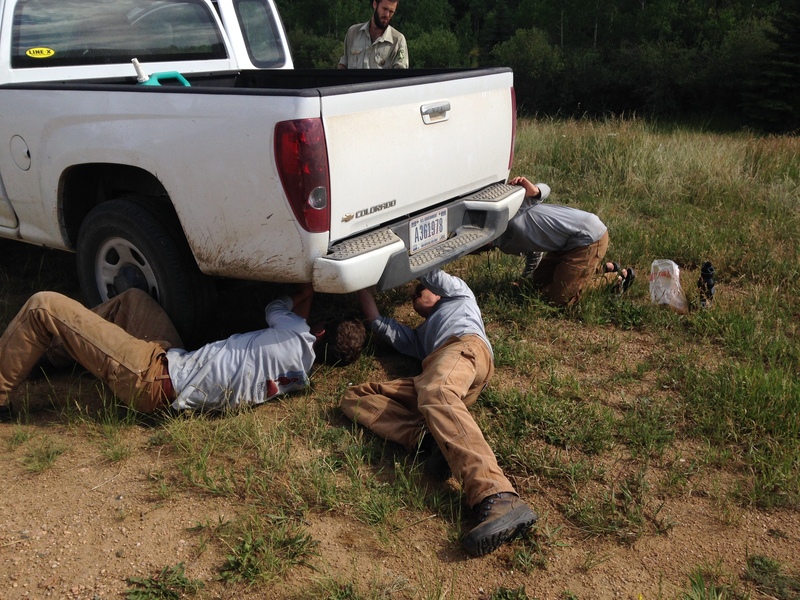 During the last week working with NPS, the Estes Crew was back in the field literally. The crew was spraying for invasive species of thistle and mullen once again. Each of the crew members were having a fun time spraying until it came to having to carry the uncomfortable packs around all day. During this week, the crew completed little horseshoe park, horseshoe park, and a elk enclosure. The crew had the pleasure of having Geoff come out for a field visit. However a storm rolled in and we were sent to the truck to wait out the storm. It was a fun time with several laughs. The crew was invited to the “Round Table”, which is a training that the resources department have each week to refine their skills. 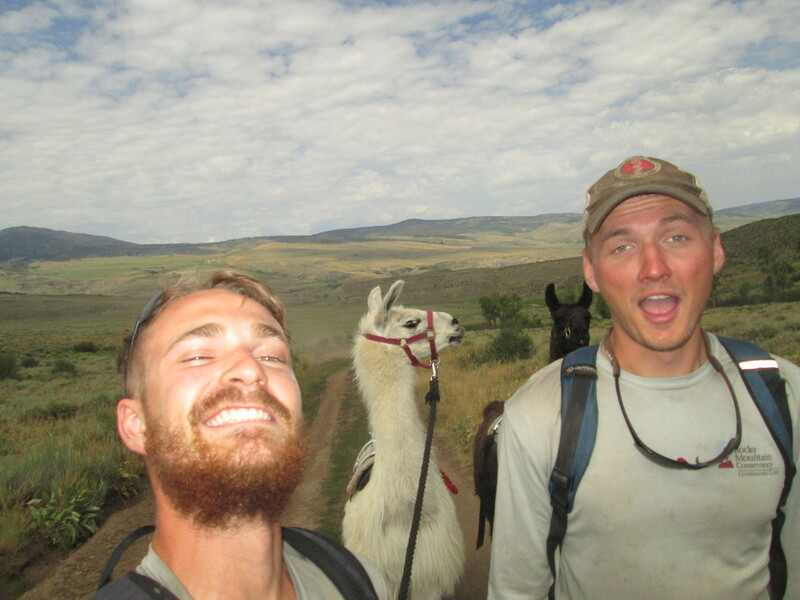 The rest of the week was pretty slow and laid back, we finished by pulling weeds and saying our goodbyes to the exotics crew would had us under their wing for the last two weeks of an adventurous and invigorating summer.